"Zoroastrianism is the oldest of the revealed world-religions, and it has probably had more influence on mankind, directly and indirectly, than any other single faith." - Boyce, Zoroastrians, 1979, p. 1. "Zoroaster was thus the first to teach the doctrines of an individual judgment, Heaven and Hell, the future resurrection of the body, the general Last Judgment, and life everlasting for the reunited soul and body. These doctrines were to become familiar articles of faith to much of mankind, through borrowings by Judaism, Christianity and Islam; yet it is in Zoroastrianism itself that they have their fullest logical coherence....” - Boyce, op. cit. p. 29. We provide the complete text of the extant Avesta, the most ancient scriptures of Zoroastrianism, as well as many Pahlavi scriptures. It also includes information about the Avestan language, and other useful information for students of Zoroastrian religion. Most of the texts in these archives are extremely rare. NOTE: Spelling of Zoroastrian technical terms has been normalized in these archives to facilitate searches. 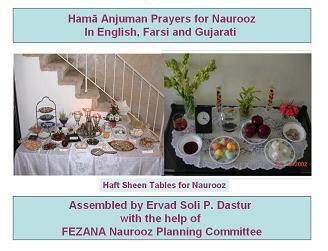 FEZANA published a Nawruz prayer book: Hama-Anjuman Prayers for Naurooz In English, Farsi and Gujarati. 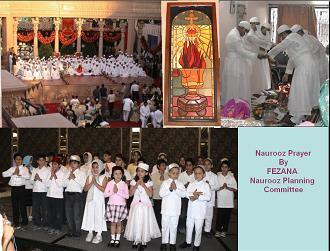 This is a humble effort to bring all our Zarathushti Groups together in a common prayer environment. If you need a copy, please contact: Soli P. Dastur at: dastur [at] comcast [dot] net. Donations for printing and postage are encouraged. Gâthâ-bâ-maâni: transliterated and translated into English by K. E. Kanga. Scanned by Soli Dastur. Used with permission. The Hymns of Atharvan Zarathushtra by Jatindra Mohan Chatterji. Chatterji's translation of the Gathas, kindly contributed by the Calcutta Parsi Anjuman and Sohrabji Panthaky, and scanned by Soli Dastur. Khorda Avesta (English) edited by K. E. Kanga, kindly contributed and scanned by Soli Dastur. Also available as an EPUB. Khorda Avesta (Gujarati) edited by K. E. Kanga, kindly contributed and scanned by Soli Dastur. Khorda Avesta (Persian) with text, translation, and commentary by Mobed Azargoshasp (3rd ed. 1354). Yasht-bâ-maâni: transliterated and translated into English by K. E. Kanga. Scanned by Soli Dastur. Used with permission. Vendidad-Baa-Nirang: Vendidad ceremony with Vendidad, Yasna and Visperad prayers and accompanying rituals performed during an actual Vendidad ceremony. Kindly contributed by Ervad Jal Noshirvan Panthaky. Vendidad Saadeh: Only 22 Fargarads (chapters) of Vendidad. Kindly contributed by Ervad Jal Noshirvan Panthaky. Dinshaw J. Irani, Understanding the Gathas. Also available as an [EPUB]. Meherjirana: The Genealogy of the Naosari Priests, courtesy of Ervad Noshir Hormuzdiar. J.J. Modi's My Travels Outside Bombay: Iran, Azerbaijan, Baku translated and kindly contributed by Soli Dastur. Zoroastrian calendar calculator (Shahanshai, Kadmi, and Fasli dates for any calendar year. Kindly contributed by Soli Dastur. Shahaneshahi calendar: 2018-2019, courtesy of Sarosh Manekshaw. Farohar or Fravashi: What is it? The Gist of the Jashan celebration. "Khushaali Nu" Jashan Prayers for Celebrations Occasions with English translations by Ervad Soli Dastur. Vendidad service book, compiled by Ervad Jal Noshirvan Panthaky (2016). Used with permission. Bejon N. Desai: Learning Avesta Compendium Copyright © 2003 Bejon N. Desai. Used with permission kindly acquired by the help of Nader M. Patel, Mumbai, and scanned by Soli Dastur. Bejon N. Desai: Learning Avesta Manual Copyright © 2004 Bejon N. Desai. Used with permission kindly acquired by the help of Nader M. Patel, Mumbai, and scanned by Soli Dastur. Kanga's Avesta Grammar Kindly contributed by Soli Dastur. Kanga's Avesta-Gujarati-English Dictionary Kindly contributed by Soli Dastur. Kanga's English-Avesta Dictionary Kindly contributed by Soli Dastur. Sunjana's Pahlavi Grammar Kindly contributed by Sam Kerr and Soli Dastur. "May your mind be master of its vow; may your soul be master of its vow; and may you live on in the joy of your soul all the nights of your life."